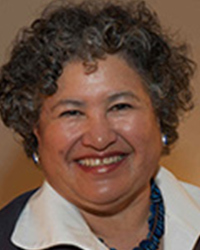 Dr. Cynthia A. Gomez is the founding director of the Health Equity Institute at San Francisco State University. She previously served as co-director of the Center for AIDS Prevention Studies at the University of California at San Francisco and has been a leading scientist in HIV prevention research since1991. Her work has focused primarily on gender, culture and sexual health, on the development of prevention interventions, and on the translation of science to community practice. Gómez has served as faculty and student mentor to individuals in multiple institutions across the U.S., particularly among underrepresented minorities. Prior to her work in HIV, Gómez spent 12 years working in community health settings, including five years as director of a child and family mental health center in Boston. Dr. Gómez has been a health policy advisor for nearly 20 years. She was an appointed member to the Presidential Advisory Council on HIV/AIDS under both WJ Clinton and GW Bush administrations. In 2007 she was appointed by California Governor Arnold Schwarzenegger to the first California Public Health Advisory Council and in 2013 was appointed to the first CA Office of Health Equity Advisory Committee. Over the years she has served on several national advisory committees including the Centers for Disease Control’s HIV and STD Advisory Council; Substance Abuse and Mental Health Services Administration’s Advisory Committee on Women’s Services; and the Institute of Medicine’s Committees on Prisoners and Research, and on Lesbian Health. Mackenzie, S., Rubin, E., & Gómez, C. (2016). ‘Prison is one place you don’t want your sexuality’. Sexuality, desire and survival among incarcerated behaviorally bisexual Black men in the United States. Champ pénal/Penal field, 13. Mann, E. S., Cardona, V., & Gómez, C. A. (2015). Beyond the discourse of reproductive choice: narratives of pregnancy resolution among Latina/o teenage parents. Culture, health & sexuality, 17(9), 1090-1104. Gómez, C. A., Villaseñor, E., Mann, E. S., Mandic, C. G., Valladares, E. S., Mercado, V., … & Cardona, V. (2014). The New Majority: How Will Latino Youth Succeed in the Context of Low Educational Expectations and Assumptions of Sexual Irresponsibility?. Sexuality Research and Social Policy, 11(4), 348-362.